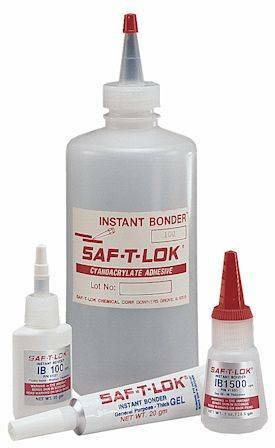 SAF-T-LOK® cyanoacrylate adhesives are a specialized series of single component, solvent free liquids that are individually formulated for instant bonding of mated metals, plastic or rubber parts and assemblies. Instant Bonders adhesives cure at room temperature without pressure to provide exceedingly high bond strengths. Cure is catalyzed by weak alkaline materials including trace amount of moisture on the surface of parts to be bonded. Shrinkage is negligible because Instant Bonders adhesives contain 100% reactive materials. Solvent resistance is very good.